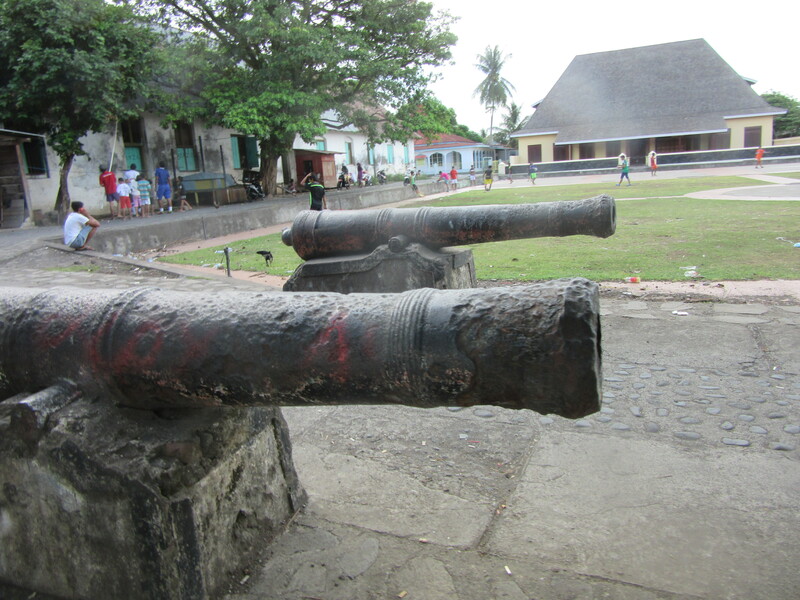 A failed trip to the Banda Islands. Then Raja Ampat. Such a low tide today, the reef is exposed, the lagoon is nearly dry and the little boats are having trouble reaching the jetty. The high tide too was extreme, the sound of the waves at 4.30am woke me up and fearing that my cabin/hut/shack might be swamped I set off down the beach to watch the sunrise. All this because the moon is almost full and that means that it has been a month since I was on Maratua which in turn means I haven’t put pen to paper or even fingers to keyboard for far too long, sorry about that, lets see what’s been happening. There have been the usual ups and downs, a definite low was being presented with a stale sandwich for breakfast one morning that contained nothing but chocolate sprinkles, though a high was drinking tea on a cliff top one afternoon with half a dozen volcanoes to gaze upon. People too, I’ve met Slovakians, Italians, Chileans, the occasional (quiet) American, French, Dutch, Germans (of course) and a whole BnB full of English, really! Right now I am on the Raja Ampat Islands off the west coast of Papua, New Guinea is right next door so that is the second and third largest islands in the world on my list of places visited lately. I am quite geographically pleased. Greenland next? My last jottings were sent from Balikpapan in East Kalimantan, Borneo where I was on a mission, an over night mission, from Manado, North Sulawesi, to stay one night and pick up a replacement credit card. Yes, I finally managed to loose mine. Stupid I know, but fortunately my bank had sent a new one to the house some time ago and Julia was kind enough to Fedex it over, sent on Friday I picked it up on Wednesday, not bad from Fairfax to Balikpapan, Borneo. 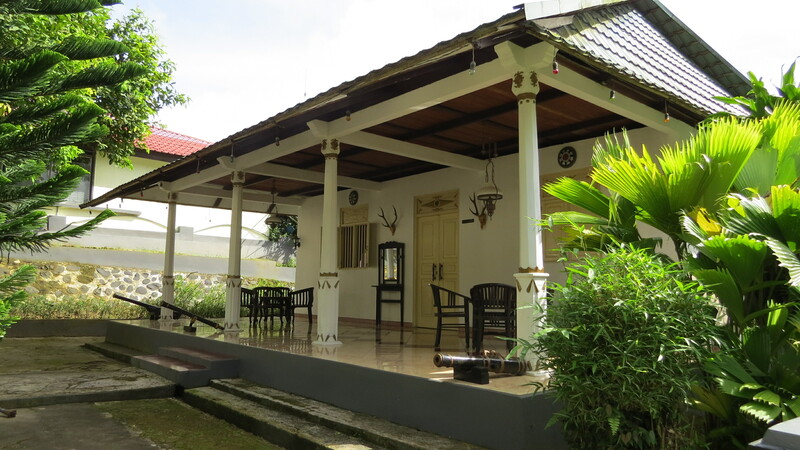 But while waiting for the mailman what was I going to do, carry on with the plan seemed best so a very quick flight to Manado in Northern Sulawesi (was the Celebes) where I was picked up and taken to an English run BnB called Bahowo Lodge. Built from scratch by Phil Boast and Paula Larcher it is possibly a perfect example of the way such places should be run. They sponsor the local village school and all the village kids receive a free, primary education, there are six classrooms with a teacher for each one. They bought a bus so the older kids can get to town for secondary school and a number have moved on to university, again sponsored by Phil, Paula and guests of the BnB. Imagine then, the jungles of Sulawesi, in the middle of a village, pigs roaming the streets, happy children singing the alphabet song and eight Brits plus an American girl from Baton Rouge. It was worthy of a screen play, a tv series, a movie. There was Marmite on toast, gin and tonics, affordable wine, egg and bacon, I mean, really, you can’t make this stuff up! No names, but there was a Chief Inspector from the Terrorist Squad and MI6 there, with his wife, who could be persuaded to tell some tales including how he was flown, by the “cousins”, from Tallahassee, Florida to Medellin, Colombia in the back of a Phantom, for coffee. You might like to do a search for Phil as not only has he written a book about building the BnB but he has also written a series of books on life in an English village. It was time to leave and another short flight across the Celebes Sea to Ternate. A tiny dot on the Planet but it looked interesting being volcanic and was on my planned route. It was billed in my book as being the perfect tropical paradise. Opinions differ! 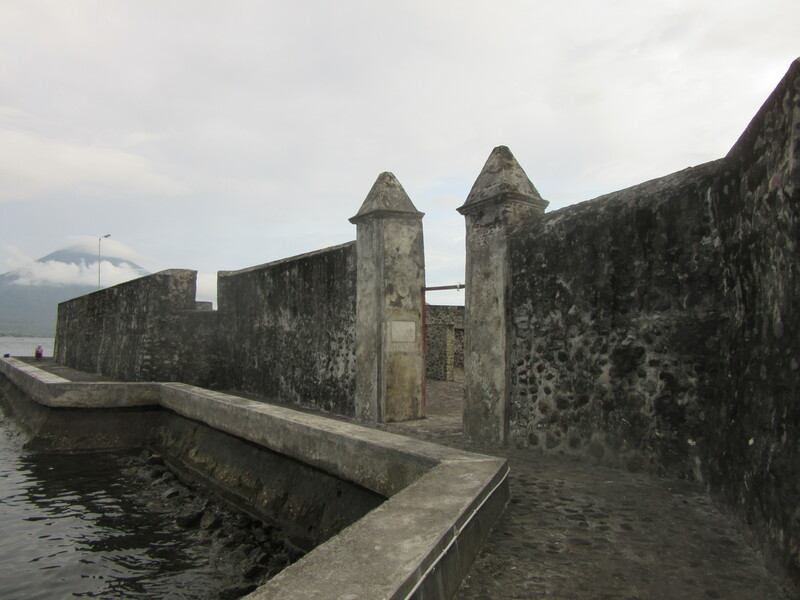 There were some interesting 17th Century Dutch Forts with old canons lying about and a most spectacular Mosque. But I think it is on the verge of converting to Sharia law and I really have no time for that. 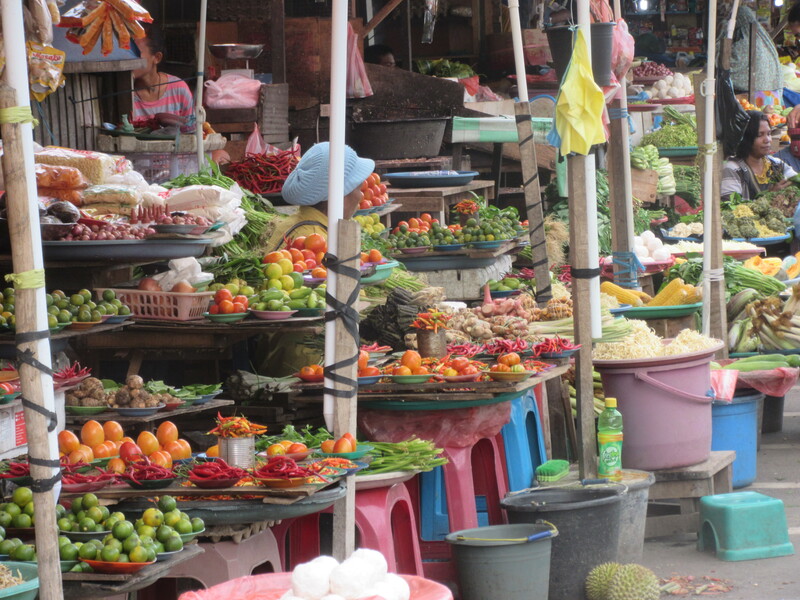 On then to Ambon, the Capital of the Mulukas, and the heart of the Spice Islands of old. A certain sense of triumph because this was perhaps the end of my Silk Road quest, for it was here that the Chinese came to find cloves, nutmeg, mace. Returning with them to the mainland they were loaded on to camels with the silks and off to Rome, Egypt and other western destinations. I sat amongst the trees inhaling the fragrances and dreamt of Samarkand, Khiva, Turpan, Tash Rabat and other Silk Road stopovers. I likedAmbon. Definitely in ‘Hello Mister” country, this being the cry of the locals as I passed by, from both the kids and the adults. I don’t think I saw another westerner the entire time I was there so there was a sense of surprise as I came in sight. 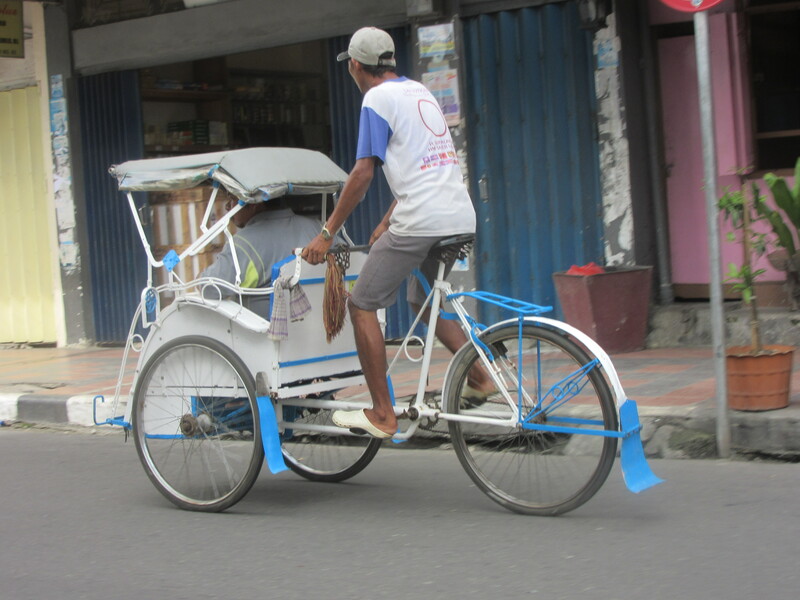 There is a mode of transport perhaps unique to the island, the becak. A small carriage for two, attached to the front of a bicycle and pushed along by pedal power. At first glance I dismissed this as perhaps a little Rajish, elitist, just a gimmick for tourists. But, as I said, there were no tourists, the locals, young and old used them. There were ranks of becaks everywhere and after careful observation I deemed them safe and took a ride. 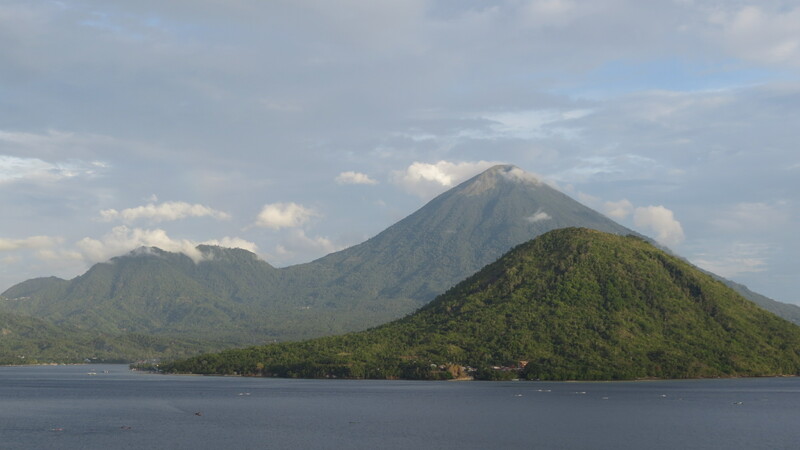 My plan was to head on to the Banda Islands, I had heard a rumor of a boat so becaked it to the port where I was deposited outside the office of the Port Authority. After much gesticulation, pointing at maps etc I determined that the boat had sailed at midnight the night before. Back to the becak and a ride to a travel agent where a delightful Indian lady did her due diligence and determined that the only airline that flies to Banda, Susie Air on a six seater, was sold out for a week. 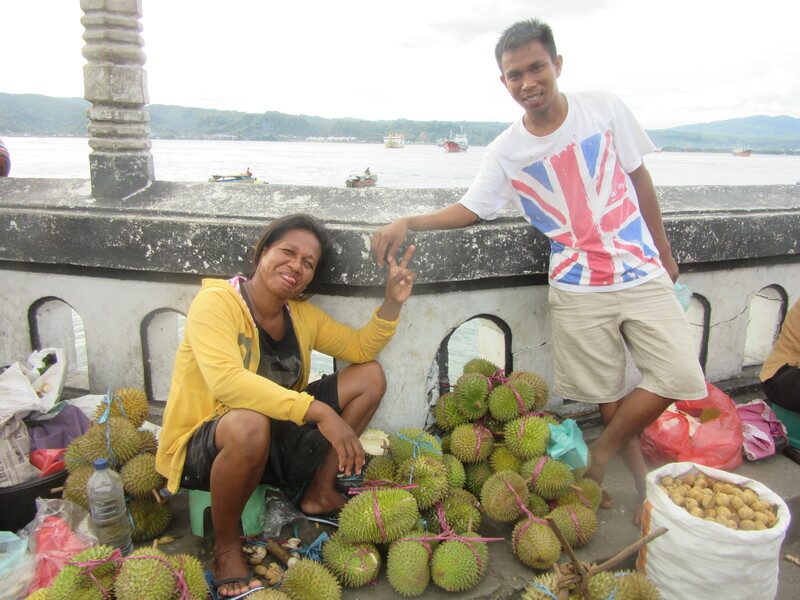 There was a possibility she said of getting a boat to the Kei Islands, about 500 hundred miles past Banda, then another boat back to my destination, though there was no guarantee that I could leave Banda in a timely fashion. If I had not lost my credit card this might have been just about possible but my mistake caught up with me, I couldn’t go to Banda and leave the country before my visa, expired. Therefore I lost the opportunity to expand on the tale of a battle between the Brits and the Dutch over a small and unproductive Banda island that the British were occupying. The story goes that they paused the battle to have tea together, had a bit of a negotiation and the Dutch decided to swap the unproductive rock for another desolate island they ‘owned’. And that is how the Brits gained Manhattan. Good story. 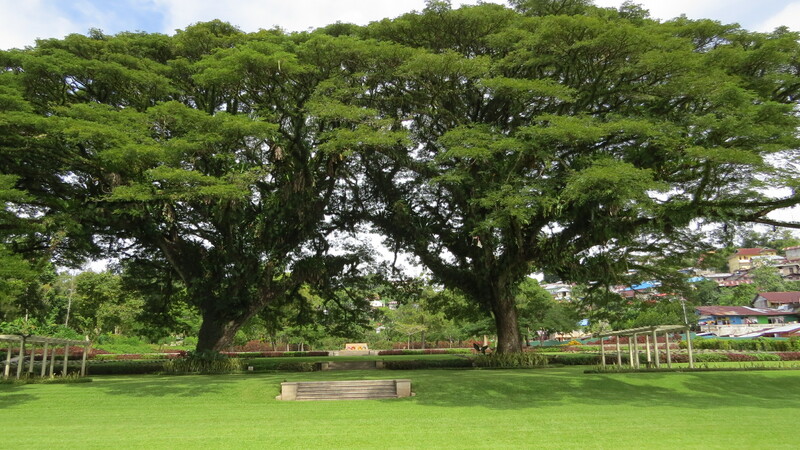 There I was then, in Ambon, without a plan. I took a tour to ponder, high up into the hills to see spice plantations. The spice trade is not what it was and though spices are grown all over there seemed to be no actual ‘farms”. Here was a nutmeg tree, there a clove, here a rambutan fruit tree and there a betel nut tree amongst the many durian trees. Although not exactly what my western organized eyes had expected it was gloriously haphazard, chaotic and I guess to some extent it worked. Cloves dried on cloths on the road surface, rambutan and durian stalls abounded and everyone seemed very happy and content. Me and my preconceptions, ha, wrong again Tim. 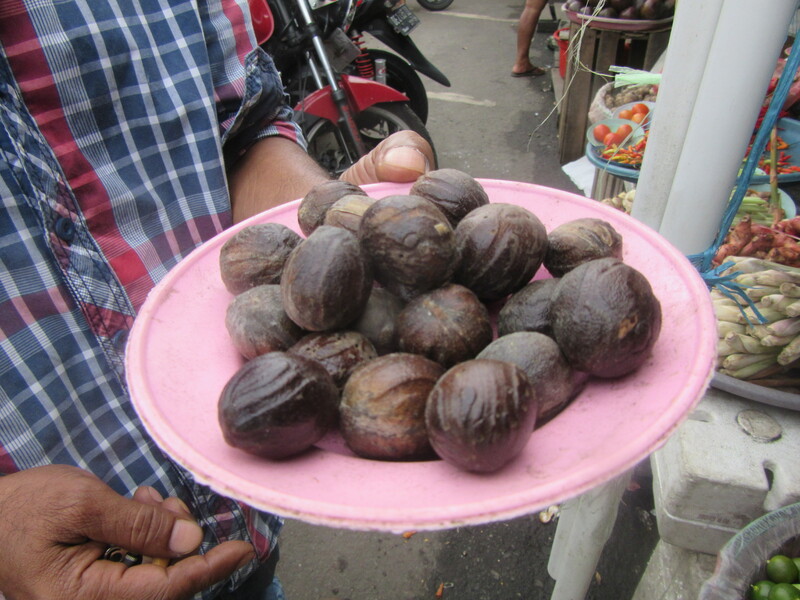 Did you know btw that nutmeg and mace come from the same nut? Nutmeg on the outside, mace in the middle. I didn’t. On a slightly negative note there has been trouble in Ambon recently between the Christians and the Muslims. I passed through areas that had been closed to traffic for months but saw little sign of destruction. The result of the disturbances is that the island is now heavily segregated with the Christians predominating in the city and the Muslims relegated to the area around the airport. Sad I find. 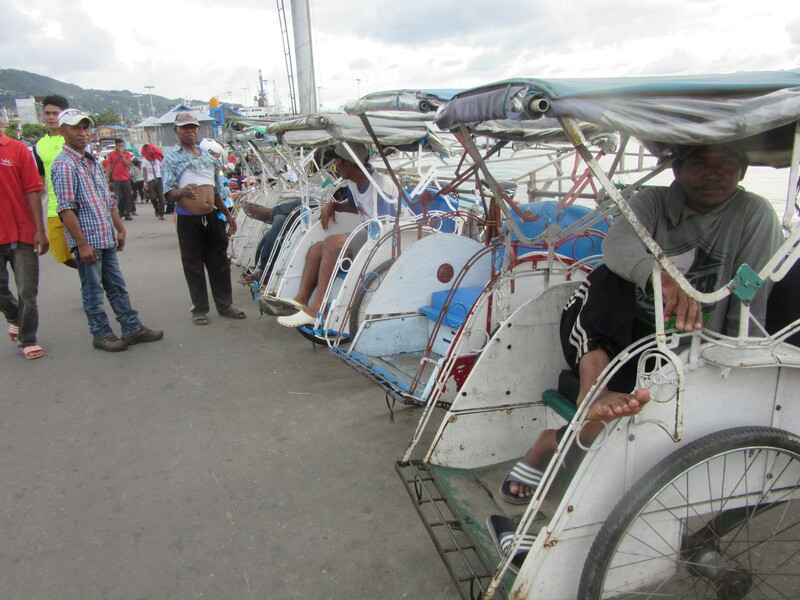 However, I couldn’t see out my visa on Ambon although the becaks were charming, the Ojeks (sitting on the back of a motor bike) slightly alarming and the Ojeks (mini buses playing very loud music) plentiful and cheap it wasn’t exactly a place to spend too much time. Research, research. I half wanted to go see the Dragons on Komodo, or hang out in the Gillis or go stay with a tribe in Papua. My eye landed on Raja Ampat off the west coast of Papua. A National Park dedicated to wildlife, fish and coral it sounded interesting. The Diving Tribe considers it some of the best diving in the world due to its location at the center of the coral triangle. I couldn’t find any suggestion of a hotel on the islands so called a homestay to check availability. Sure, said the guy, fly from Ambon to Sarong, pick up the once a day ferry to Waihai and we will pick you up at the jetty in the speedboat for the ride to Kri. Its not easy these days escaping far the maddening crowd. 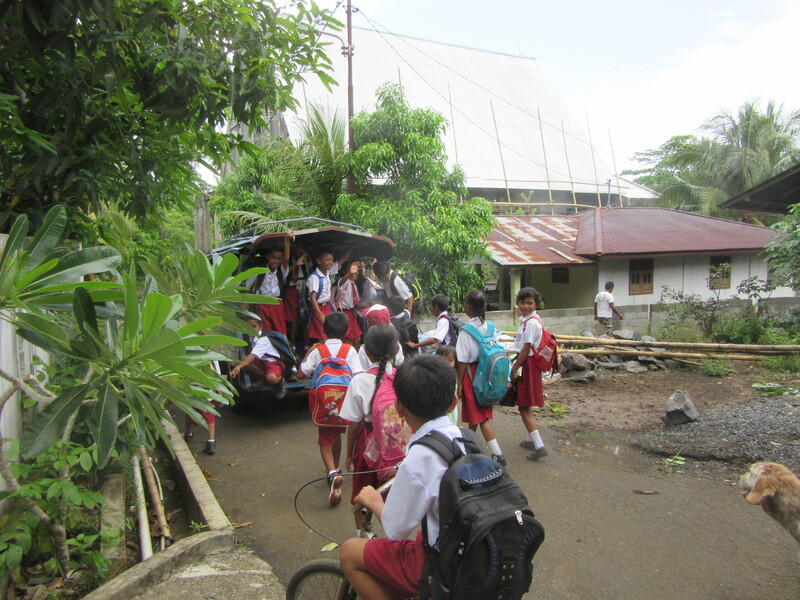 A classroom in Bahowo village. Sulawesi. A big volcano and a small one. Allied World War 2 Cemetery. 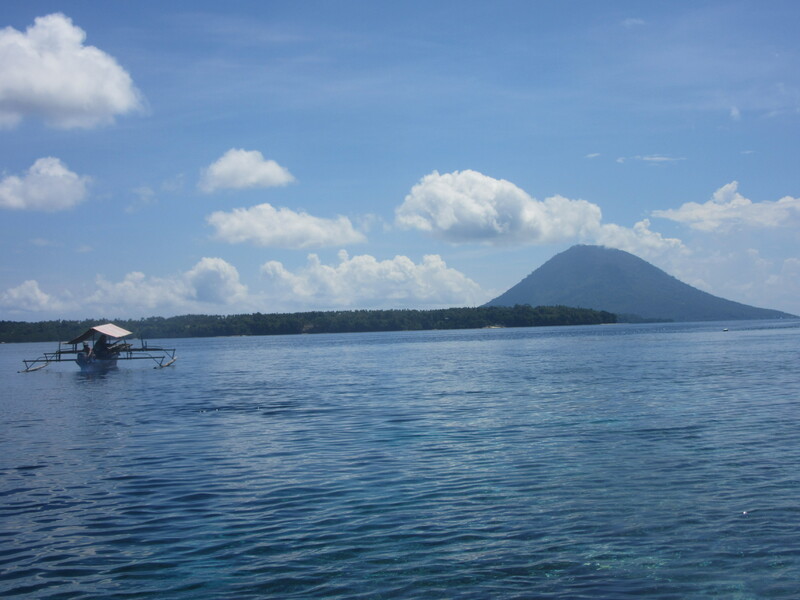 This entry was posted in Uncategorized and tagged Ambon, Bahawo Lodge, Manado, Raja Ampat, Sulawesi, Ternate. Bookmark the permalink. Another great and interesting post. Love that you created a verb ‘to becak’. Still confused about the nutmeg/mace, because we grind the whole nutmeg? Those in the photo look huge. More information please! Somewhere I have a photo of nutmegs growing on a tree with the mace clearly evident at the core. I will try and find it but as time goes on finding a particular photo becomes more and more challenging despite my cataloguing. Aren’e we famous for turning nouns into verbs! So true Victoria, so true. I just spent two days in Singapore and frankly couldn’t leave fast enough. From the sublime to the ridiculous ain’t in it! I felt quite breathless after reading this blog. Will certainly look up Phil Boast. Interesting about the nutmegs. I still have some brought back from Barbados! Ah. There is a longer story to the feather quest. I’m not sure it was a complete success but the result is causing me some anxiety! More, much more when I see you. Fascinating stuff! Nice story about Manhattan too. Each place you visit is incredibly blog-worthy, even those places you aren’t so keen on. You make it ALL sound fascinating! I know Annie but then again there are places I have been that I haven’t even mentioned which is regrettable.